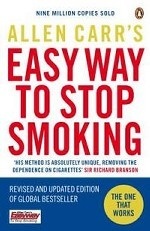 Аннотация к книге "Allen Carr`s Easy Way to Stop Smoking: Be a Happy Non-smoker for the Rest of Your Life"
Reading this book is all you need to do to give up smoking. You can even smoke while you read. There are no scare tactics, you will not gain weight and stopping will not feel like deprivation. If you want to kick the habit then go for it. Allen Carr has helped millions of people become happy non-smokers. His unique method removes your psychological dependence on cigarettes and literally sets you free.